A news outlet has apologised for a tweet wishing Jews a happy Chanukah which included a picture of the Romans plundering the Menorah from the Holy Temple in Jerusalem. On Chanukah, Jews light a Chanukiah (eight branched candelabra, with an extra higher branch called a shamash) in commemoration of a miracle thought to have taken place around 165 BCE, when Jews in Israel revolted against their Seleucid Greek overlords, retaking Jerusalem and purifying the Holy Temple. There was only enough pure oil to light the great Menorah in the Temple for one day, but the oil was said to have burned for eight days, until new supplies of pure oil were available. However, the picture attached to the Catholic News Service tweet showed a panel from the arch of Titus, built by the Roman emperor to celebrate capturing Jerusalem and destroying the Temple in 70 CE. The panel depicts the legions carrying away the spoils from the Temple, including the great Menorah. Catholic news service uses photo of the Arch of Titus, which commemorates the defeat of the Jews after the destruction of the temple in Jerusalem, to wish the Jewish people a happy #Hanukkah. 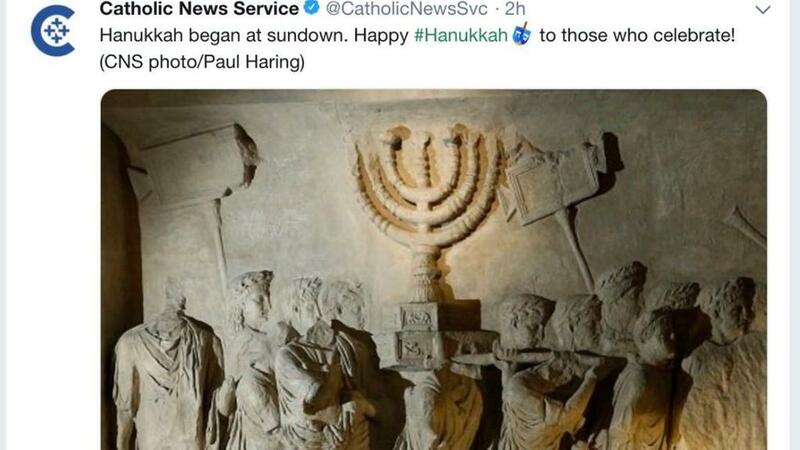 For those wondering: the Catholic News Service tweeted the famous Arch of Titus, Spoil of Jerusalem relief panel as a ‘Happy Hanukkah” message. But sure, don’t take a humanities class. It’ll be fine. On Monday, the outlet added: “Sunday we inadvertently posted an offensive photo. We were sloppy in our tweeting; people were right to be offended.